Pear Pizza | Time to Cook! I love brick oven pizza – the crust is so light and crunchy and the toppings take center stage. When I saw this recipe in the Wall St. Journal for making pizzas at home, I thought it would be fun to try. This is not an easy weeknight dinner, but this is doable over the weekend (and can be a fun “hands-on” dinner party idea) – and best of all, you can make parts of it ahead of time. You can make the sauce up to 4 days ahead, the dough up to 3 days ahead (or frozen up to a month ahead), and the rest is easy. Three quick notes — 1) take the fresh mozzarella out of its liquid the day before you make your pizzas so it doesn’t soak your pizzas, 2) the dough might need a bit more cold water when mixing (up to 1/2 cup), and 3) I substituted pancetta for the guanciale. I did not have a pizza stone and my pizzas turned out just fine. You will be amazed at how good these artisanal pizzas are – made in your own kitchen! 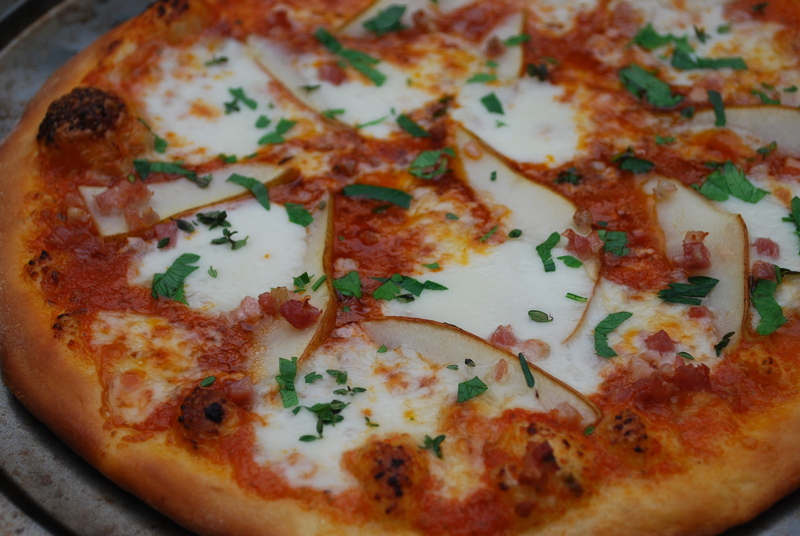 This pie is all about contrasts: salty guanciale, sweet pear, mild mozzarella and sharp provolone. Scatter half a very thinly sliced pear, ¼ cup diced provolone, ¼ cup fresh mozzarella and ¼ cup finely chopped guanciale onto dough. Slide pizza onto hot stone and bake at 500 degrees until cheese melts and crust is golden brown, 5-7 minutes. When pizza comes out of oven, scatter 1 teaspoon mixed herbs (try parsley and thyme) on top.